Actual Southern California locations where "Sky High" was filmed. which is located at 18111 Nordhoff Street, in Northridge, CA (in the San Fernando Valley.). The library is located near the center of the CSUN campus. in Pasadena, CA. (The dam runs parallel to (and just north of) Oak Grove Drive (and the 210 freeway). The road is no longer open to traffic, but there is no perilous drop-off at the east end (that much was f/x). In the photo above, the camera is looking northeast. In the photo below, it's looking northwest. shot on Meridian Avenue, just south of corner of Prospect Circle at Meridian Ave (looking northwest). after she kisses him) is just around the corner, at 410 Prospect Circle (in South Pasadena). so the actual address of the house is 1002 Highland Street, in South Pasadena. 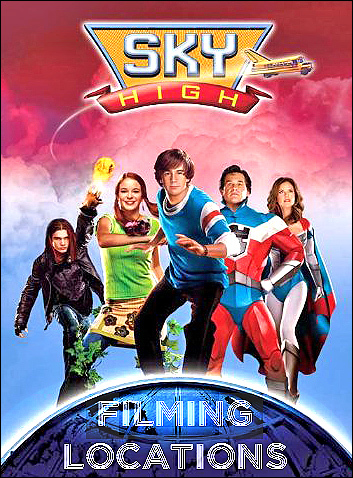 The photos on this page are stills from the DVD of "Sky High"